The ice cream aisle is flooded with low calorie choices. Last week, I shared one of my favorites - Haagen Dazs small cups. So, when I was staring at the Haagen Dazs (where there wasn't any low calorie chocolate option), and my eyes wandered to the popsicles. There was an old favorite, Fudgsicle, with a green label shouting, "Low Fat - 60 Calories per Pop". nonfat milk, sugar, corn syrup, whey, high fructose corn syrup, water, palm oil, cocoa processed with alkali, tricalcium phosphate, mono & diglycerides, cellulose gum, guar gum, malt powder, salt, polysorbate 80, polysorbate 65, carrageenan. So, basically, you get milk, sugar, cocoa, and some chemicals and you get a Fudgsicle! This isn't really a healthy snack, but if you compare it to eating - let's say a bowl of chocolate ice cream - you are getting a treat without the heavy duty consequences. I think they are pretty delicious and my kids love them. The popsicle is a perfect portion for treat. There isn't anything nutritious about them. They have HFCS and other things you might want to avoid. The Haagen Dazs small cups ingredient list was much cleaner, but there wasn't any chocolate. Perhaps they will come out with a chocolate sorbet flavor soon. One note, there were a couple different types of Fudgsicles in the freezer including "sugar-free". This version contained artificial sweetener which I avoid feeding my kids. Just buy the "Original Fudgsicle". 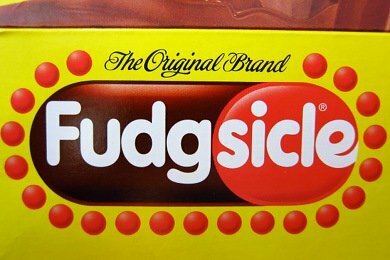 What do you think of Fudgesicles? You can make your own Fudgsicles. Just make a homemade chocolate pudding, put it in some popsicle makers, and freeze! My mom did this for us when we were little. Then you can control the ingredients. Good Morning Lisa! Thank you for the details about original fudgsicle. I wonder, is it any different from the Blue Bell mini fudge pops? Also I like the do it yourself idea. pudding pops are the most wonderful thing ever. even if you just stick a popsicle stick i an open pudding cup and freeze it. Wonderful! My grandma used to always have these... I think I'll try making my own... I was going to just use chocolate milk. I have this really cool popsicle maker and I've made pops with chocolate milk and egg nog... I think they taste pretty good. I would just use NF or 1% milk with Hershey's syrup to make the chocolate milk, but I guess I've never looked to see what is in that. Eek. Maybe some chocolate protein pops would be better?? i know we're all supposed to be wary of and to avoid HFCS, but i'd love to have the facts about why! did you do a post on this ever? if not, would you like to? or perhaps just a link to good info... love all these ideas about making your own. and, making your own pudding isn't hard, so i might go for that, too, rather than a packaged pudding. thanks so much! Have you tried Sweet Nothings frozen fudge bars? I've been eating them for years--they're delicious, and dairy-, fat-, and soy-free, and only 100 calories! Their ingredients are as follows: FILTERED WATER, MIXED FRUIT CONCENTRATE (PINEAPPLE SYRUP, APPLE, PEAR AND PEACH CONCENTRATES), BROWN RICE SYRUP, PEA STARCH, COCOA (PROCESSED WITH ALKALI), CAROB BEAN GUM, GUAR GUM, NATURAL FLAVOR. While they've got "cleaner" ingredients than Fudgsicles, I still consider them a "junk health food," and consume them accordingly. They have a mango-raspberry flavor, which also is really great! If you give 'em a try, let me know what you think. Thank you for sharing with all of us your valiant efforts to eat more healthfully, and keep up the good work! Awesome! I love fudgesicles. Now if the weather would just cooperate and warm up! Stephanie - Hersheys chocolate syrup does have HFCS in it. There are lots of recipes online for homemade chocolate syrup that you can make very eaasily. Susan - I think a lot of people are concerned with HFCS because of the chemicals and enzymes that must be added into the corn in order to be able to render "sugars"(technically starch) from it. However, if you are buying white, refined sugar there are still chemicals added to remove "impurities" from the sugar but making sugar is a natural process. Essentially it is mashed up sugar cane that is boiled down until the sugar crystals form. "Raw" sugar does not have bleaching chemicals added. If you had sugar cane you could technically make your own sugar but you can not make your own HFCS with corn you grow. Good article, getting to the point that the Originals have only 60 cal, so why should you bother to go to the "Fat Free"? In fact you should avoid the Fat Free for 2 reasons, #1 because they have Aspertame which is bad, and #2 because when you eat food that is totally fat free it doesn't satisfy you so you might be back at the fridge 10 minutes later! My PROBLEM is that the 60 cals are harder to find than any of the other "versions". But after considering this a little more, i decided that Original Fudgsicles are by any measure quite expensive. In my Dominicks, they cost .19/ounce = $6/quart ! (and never on sale). But I can get a quart of Lucerne choc ice cream for less than $2 /quart. Conclusion: take those fudgesicles and shove 'em. Gracias. Appears they even sell them in Wal-Mart these days! I live in Manhattan and find them in Whole Foods and in the ever-dwindling "Mom and Pop" health food stores here in the city. They're sold individually and in boxes of 6. I hope you can find them--they're really good for that junk-food fix, and not quite as "junk-y"! For the vegan's out there... Toffuti makes a vegan version with 60 calories also! Sooo good! Fudgesicles are good for a hot summer afternoon!! I just bought a box of 20 pops for $4. I sort of wish they didn't contain HFCS! I love the original pops and have enjoyed them for decades. Recently I have noticed the sticks are not smooth like they used to be but are now full of little splinters. It makes it difficult to lick them clean. Just curious as to why they aren't smooth anymore.